This image of SN 1987A combines data from NASA's orbiting Chandra X-ray Observatory and the 8-meter Gemini South infrared telescope in Chile. The X-ray light detected by Chandra is colored blue. The infrared light detected by Gemini South is shown as green and red. The ring is produced by hot gas (largely the X-ray light) and cold dust (largely the infrared light) from the exploded star interacting with the interstellar region. Newly detected dust found around the burst remains of a dead star could help reveal how planets and stars formed and how life began. About 160,000 years ago, a star 20 times more massive than our sun erupted in a fiery explosion called a supernova. The star was located in the Large Magellanic Cloud, a nearby dwarf galaxy. 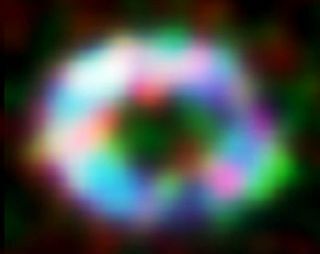 In 1987, the first light from that catastrophic event reached Earth and for several months, the supernova, dubbed SN 1987A, blazed as brightly as 100 million suns before fading again. Now, nearly two decades later, astronomers have detected dust particles around the supernova that they think formed before the star exploded. The new finding is the first evidence that star dust can survive a supernova explosion. It is also providing a rare glimpse into a process called "sputtering," in which dust is eroded by interactions with superheated gas. "Supernova 1987A is changing right before our eyes," said Eli Dwek, a cosmic dust expert at NASA Goddard Space Flight Center in Maryland who was involved in the finding. "What we are seeing is a milestone in the evolution of a supernova." Finer than grains of beach sand, stellar dust is a constant source of frustration for astronomers because it can obscure observations from distant stars. Yet the troublesome dust is also a prime ingredient in the construction of planets and of all living things. The dust is made in the fiery furnaces of stars as they burn and is scattered across space either by stellar winds or by supernova explosions. Despite its importance, scientists still know very little about star dust. How much dust does a star produce throughout its lifetime? How much survives a star's death? And how do rings of dust coalesce to form stars and planets? 1987A's newly detected stardust, found using an infrared telescope at the Gemini South Observatory in Chile, could help astronomers answer these questions. The dust particles are intermixed with superheated, X-ray emitting gas and found within an equatorial ring around SN 1987A. About a light-year across, the ring of gas and dust is expanding very slowly. This suggests that the ring was created about 600,000 years before the star exploded, the researchers say. It is therefore unlikely that the ring was created by a supernova blast during the star's death, but rather by stellar winds when the star was still alive. The ring of dust and gas remained invisible for nearly twenty years until shockwaves from the supernova blast caught up with it. As the shockwaves expanded, they passed through the ring, heating up its gas and normally cool dust until they glowed in the infrared. "This much was expected," said study team member Patrice Bouchet of the Observatoire de Paris. "The collision between the ejecta of supernova 1987A and the equatorial ring was predicted to occur sometime in the interval of 1995 to 2007, and it is now underway." What was surprising, however, was the composition of the dust, which followup observations with NASA's Spitzer Space Telescope revealed to be almost pure silicate. Also, far less dust than expected was detected. A star as massive as the one that created SN 1987A was thought to produce much more dust. The dearth of dust could mean that shockwaves from the supernova blast destroyed more dust than originally thought. This could have broad implications for determining dust origins throughout the universe if confirmed, the researchers say. A spate of new infrared, optical and X-ray observations of SN 1987A are now planned to follow up on the new findings.